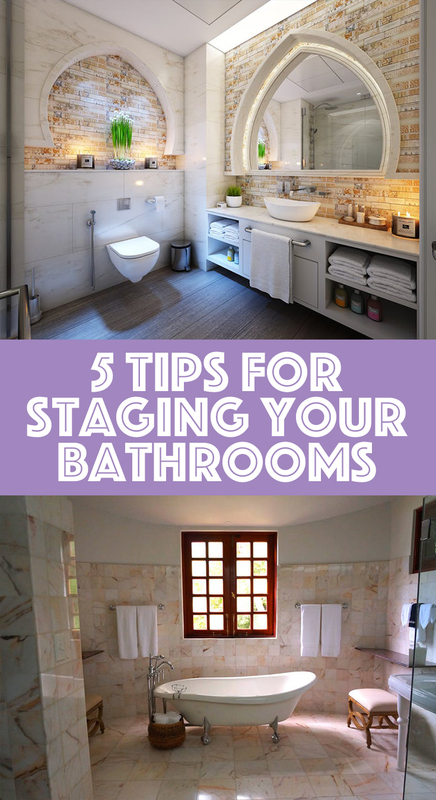 Staging your bathrooms for a showing can be simple. Read up on our favorite tips for making your bathroom beautiful for potential buyers! Hide all your personal belongings. It’s just a little weird to look at other people’s toothbrushes and their preferred brand of shampoo. Put away all of those things from your counter and shower away under the sink in a drawer. Consider a couple small upgrades. A little bit of sprucing up can make a big difference: repaint the walls, replace the cabinet hardware, purchase an new mirror, or buy new bath rugs. Clean, clean, clean. Bathrooms are dirty places and the last thing a potential buyer wants to see is anything unkempt. Scrub that shower, wipe down the counters, and mop the floor. Keep things simple. If possible, keep the color palette of each bathroom neutral. You want to appeal to as many buyers as possible. To keep things interesting, you can add a pop of color in a rug, hand towel, or mirror frame. But as far as tile, paint color, and cabinetry, stick to neutrals. Add a couple pretty accessories. Try putting out a small vase of flowers, a woven basket, or a mosaic soap dispenser. Don’t add unnecessary clutter, but one or two attractive pieces can add a lot of interest. Remember these tips and your bathroom will be much more attractive to potential buyers! And happy buyers means a quicker sale!